We are a family practice dentistry located in Midlothian, VA.
and we do our best to accomodate all of our client's needs. and would love to serve your family. Dr. Thomas Olivero, Jr.was born in Virginia, but raised in New Jersey. He graduated from the University of Richmond and VCU-Medical College of Virginia. Tom was a commissioned officer in the US Public Health Service and served on the Apache Indian Reservation for three years following dental school. He returned to Virginia and entered private practice in 1993 and has been practicing in Midlothian since 1999. Dr. Olivero is also a Commander in the US Navy Reserve and provides dental support to the Marine Corps. He is an active member in the ADA and Virginia Dental Association. Tom is also a member of the Midlothian Dental Study Club. Colleen Olivero attended James Madison University for two years before transferring to the University of Michigan, where she received a B.S. in Dental Hygiene and a Master�s degree in Public Health. Colleen and Tom met on the Ft. Apache Indian Reservation and have been married since 1993. They have three children. Sandy Pfaffenberger graduated Fairleigh Dickenson University in 1990. She worked 14 years in a periodontists office in New York. Sandy brings a wealth of experience to our patient care program and is certified in local anesthesia. She has been with our office since 2004. Sandy is married and has three children. Kristina Outman is our chairside treatment assistant. Kristina received a certificate of completion at Chesterfield Technical Center for Dental Assistanting. She has been with our practice since 2000. She directly assists Dr. Olivero with all phases of patient care and supervises the infection control program for the office. Kristina is married and enjoys spending time with their two dogs. Amy Turner is our front desk coordinater. 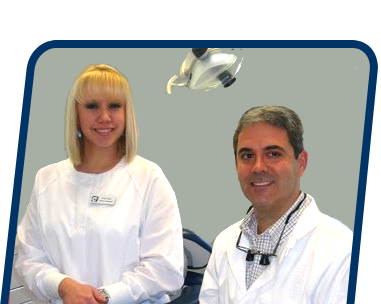 She has been with our practice since 2009 and has over 15 years of experience in the dental field. Amy enjoys spending time with her children. Please don't hesitate to contact us about any of our services or to schedule an appointment. Copyright © 2008 – Olivero DDS. All Rights Reserved.